I gave my wide angle lens a rest and decided to try some street photography with a telephoto lens, the 70-200mm f2.8. With a wide angle lens, you feel as if you are part of the situation since you are so close to your subject. This can make everything seems more intimate. The telephoto lens allows for a feeling of separation, and you are merely a spectator watching from afar. It's quite a different style of shooting as the lens is pretty big, heavy, and definitely makes it hard to blend in, or go unnoticed. The extra focal length however makes it a powerful tool for people watching. I plan to explore this perspective further in the coming days. An angry traffic cop hollers at a bus driver near Times Square. 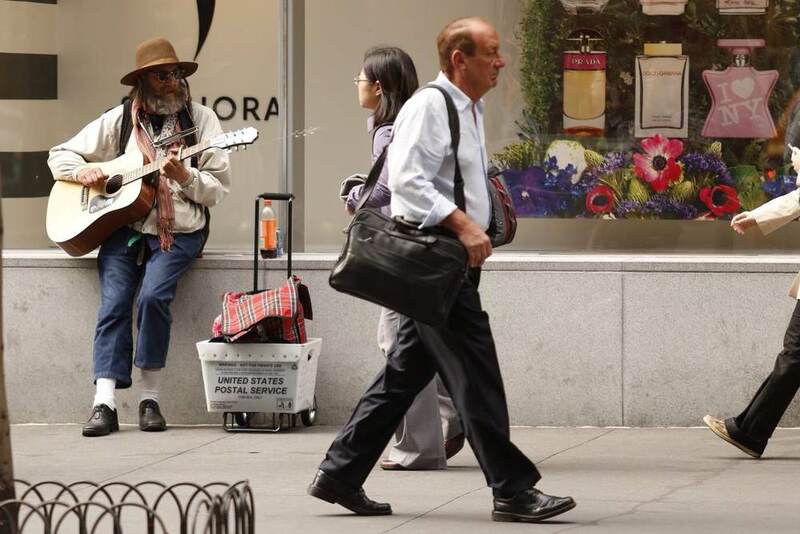 A man uses the ledge of the Sephora makeup store to strum out a tune as commuters hurry by. Thanks for a Great Central Park Workshop!